Although it seems like it should be simple to define what you do and offer in one statement, it’s not. Creating a positioning statement that guides your messaging hierarchy requires discipline, insight, a focus on your audiences, an understanding of what makes you unique … and a good wordsmith. Once achieved, the positioning statement is at the core of communications–it defines who you are from the audiences’ point of view. Every word must add to the meaning and tone you wish to create. It must support how your audiences perceive you. It defines what you offer that they value. A good positioning statement doesn’t focus on the specific products or services you provide. It summarizes how you work with your customers, what they can expect from you, what you bring to the table beyond any specific products or services. When enhanced with a value proposition and three key ideas (as well as the brand promise) your positioning statement will guide your entire marketing program. Use it as a checkpoint, to test new campaigns or content development. Extract the ideas and concepts to inspire headlines for ads or copy for websites. The positioning statement is the single concept or impression that should come to mind when someone thinks of the organization—the thing that distinguishes you from competitors. Positioning influences all aspects of messaging. In the messaging architecture we create for clients, the positioning statement expands on the brand promise. It expresses what makes you unique, what’s important to your target audiences, and what’s important to the organization. It defines who you are. 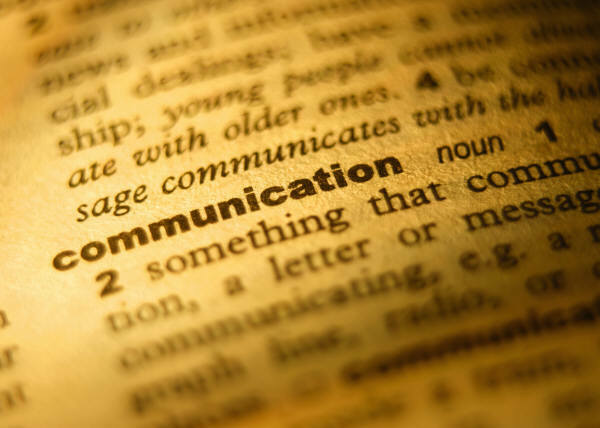 The messaging hierarchy serves as the basis for consistent communication, in words and graphics. Messages are shaped and expressed to connect with the target audiences, at each touch point and in any form of communication. Messaging is not about being all things to all people. It’s about defining and focusing specific ideas to specific targets. There is more power and impact in focus than in a broad reach into broad categories. 3 key messages: these three ideas summarize three top-level concepts that are unique to your organization, each supported by three proof points. Once the messaging hierarchy is complete, it becomes the foundation for all communications. By distilling core values and essential ideas from your audiences’ points of view, it also helps unify staff and guide the internal brand. For examples of positioning and messaging, please see our website. The visual and verbal brand is guided by positioning, more here. Wondering where to get started? 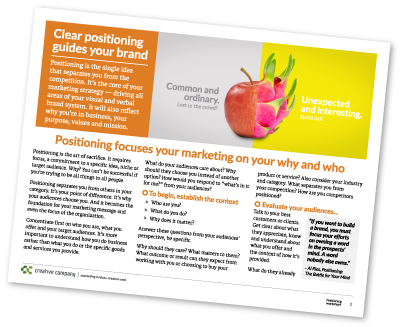 Download our positioning worksheet below.